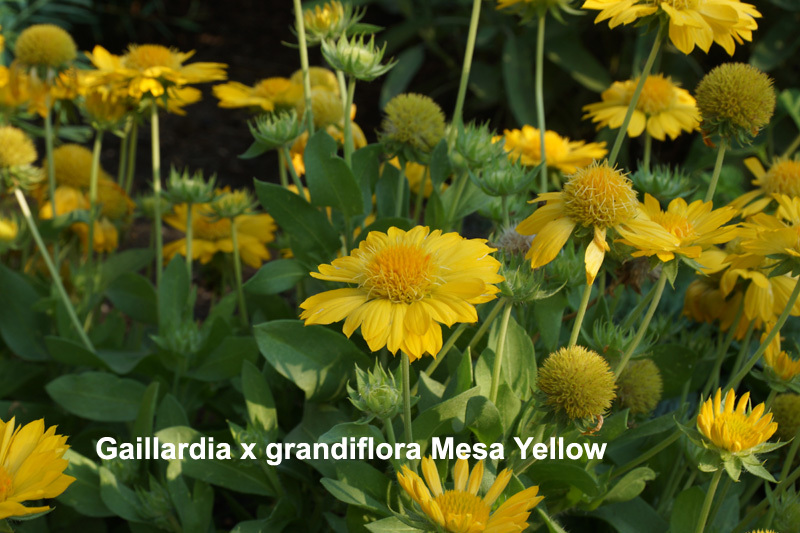 If you are looking to add some color to your yard, here are three options which are blooming right now. They are all perennials that will come back year after year. They will attract butterflies, although the populations are just beginning. The final two flowers are Viburnum. I don’t have the exact species. They smell just like a Parisian perfume – only better. This plant turns into a fairly large bush, but can be pruned to keep it to a manageable size. Your local nursery should have this bush. 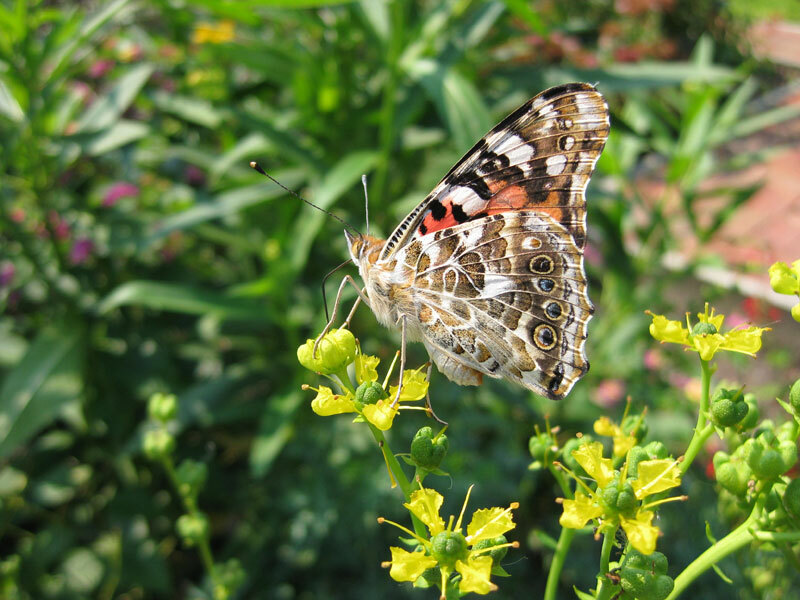 Ideally butterflies will find plenty of nectar in the flowers they find outside, but there are occasions when the flowers are gone and you want to feed some butterflies which have come out late in the fall or very early in the spring. Here are some possible solutions. Note – the reason this subject came up was because a friend had a butterfly house, that I used to think were a waste of money. The house was outside until January 1st, when she brought it inside. The next day, a Mourning Cloak came out into the house. She has been feeding it every day for the last three weeks. Fruit – I’ve used watermelon and orange slices and honeydew melon. Gatorade – I use the plain version. I’ve also heard of people using Juicy Juice. Hummingbird mix – 4 to 1 mix of water to sugar. 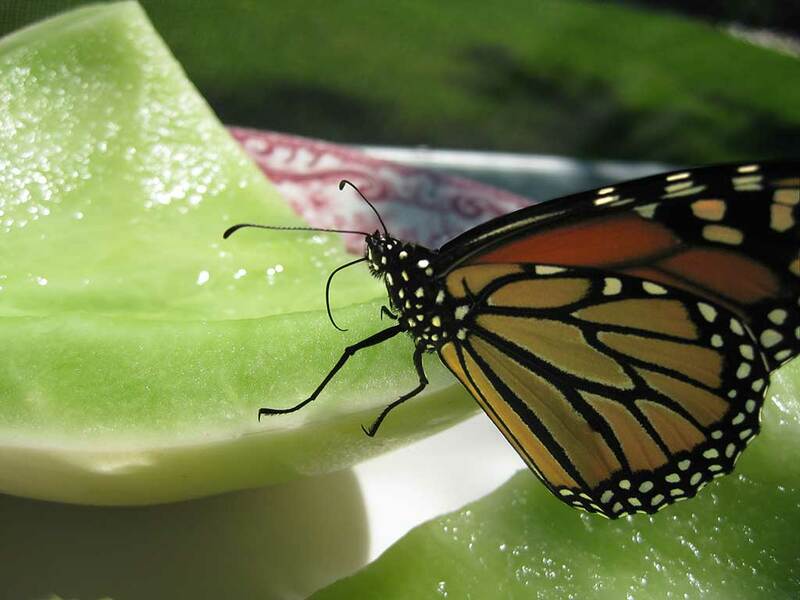 Monarch Watch – sugar/honey – 1 part to 9 parts water. Nigel Venters Mix – 1# fructose, 1 cup water, bring to a boil for 2 minutes and then add 1 tsp of soy sauce. Use this as a concentrate. Add to water in a 1 part concentrate to 9 parts water. 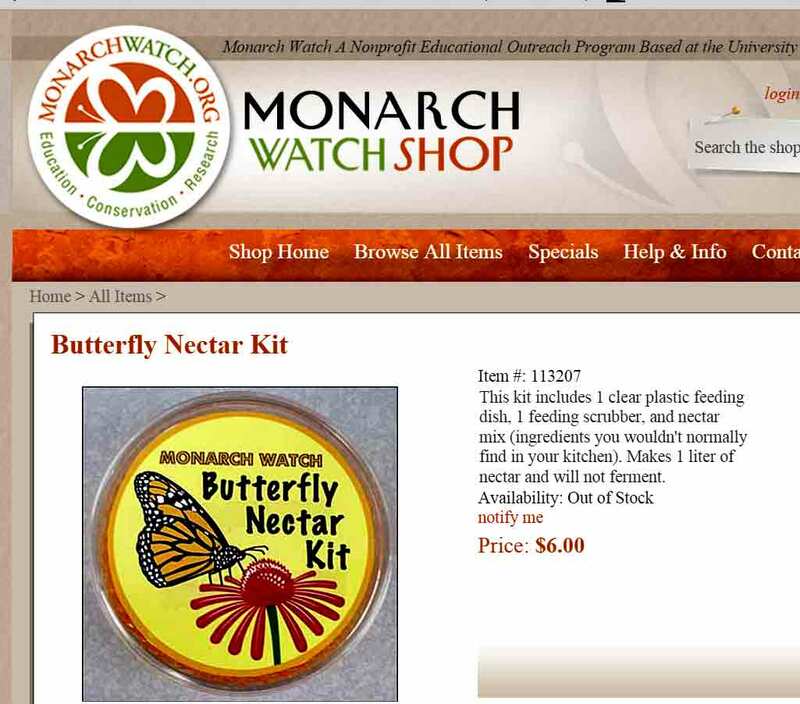 Monarch Watch has an artificial nectar mix they sell. I bought one and here are the directions. 1 drop fruit extract – any kind. Contents of the packet – there is no indication what this is other than some sort of preservative. They tell you to keep this in the refrigerator and it should last for months. Note – this small packet has about 15 nuggets of bee pollen. Some dissolves and some doesn’t. This seems like a simple ingredient to add to any mix. I take bee pollen every day so I always have some around. Monarch Watch also suggests putting the nectar up high and near a light source. 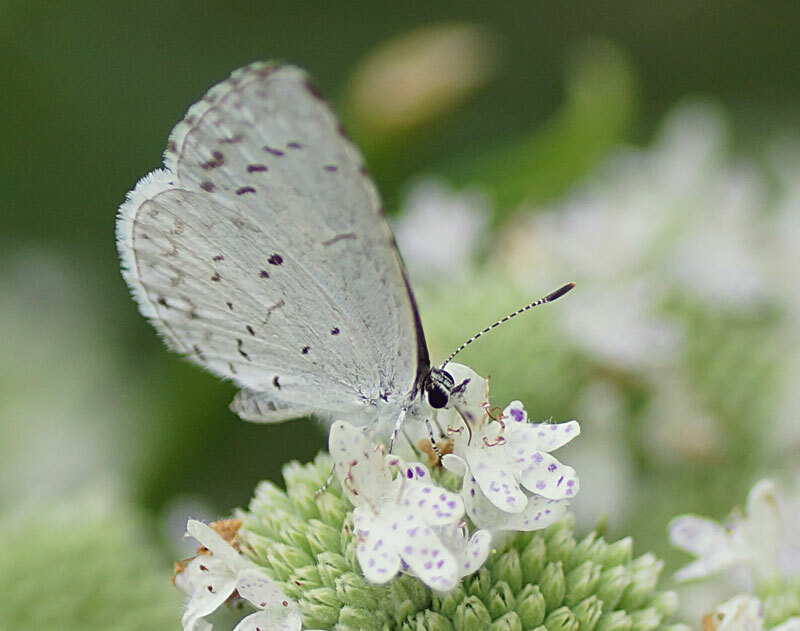 One of the native plants that I recommend for most gardens is Slender Mountain Mint or Pycnanthemum tenuifolium. 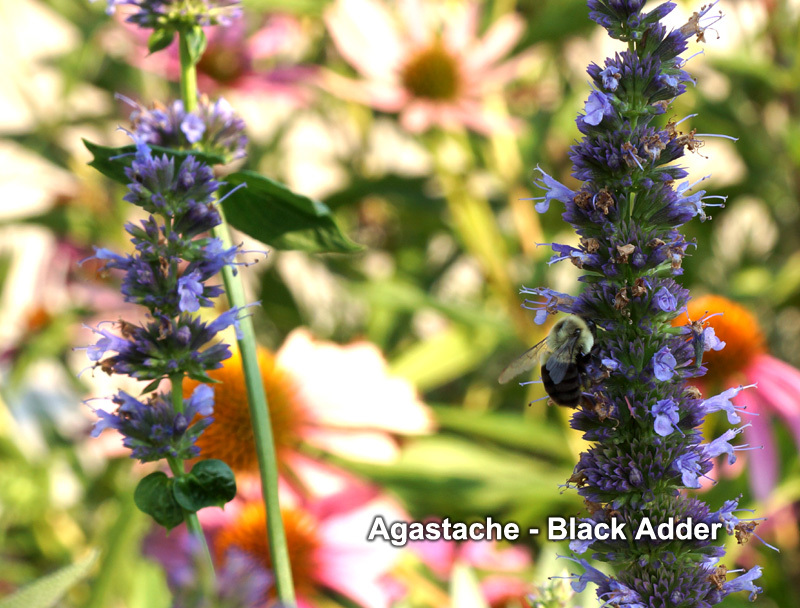 What’s good about this plant is that it attracts a lot of butterflies and bees, lives a long time and blooms almost all summer long. What’s bad about the plant is that it wants to spread and is a bit invasive. I just spent about three hours digging it out of a couple areas and have the blisters to prove it. It’s not as bad as common mint, but it definitely will take over an area if you let it. I still have two areas where I have it in my garden. One area has a problem with erosion and so this plant is ideal for that. The other area is one that I just have to control it by digging every year. What is beautiful about the plant are the orchid like flowers and the many types of butterflies it attracts. It’s also a bee magnet, so if you have kids you may want to put in in an area which is away from foot traffic. 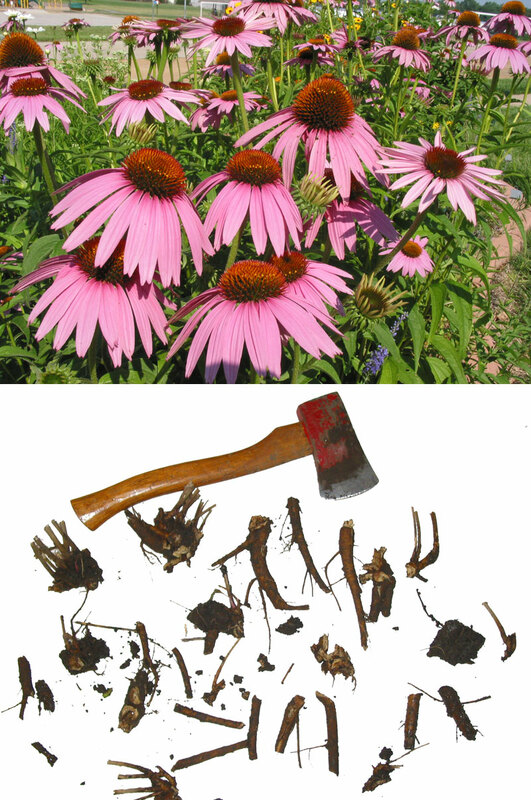 I’ve discovered that propagating Echinacea – Purple Coneflower – from root cuttings is a fairly easy task. Get out your shovel and dig out about half of your plant. I like to leave 50% in the soil to ensure the plant comes back well. I then use a combination of my axe, and pruners to cut up the larger roots into two inch segments and plant them upright in potting soil-then water well. 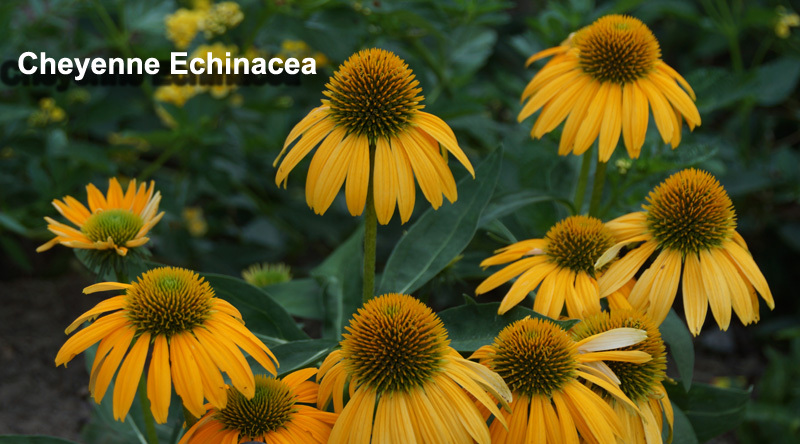 I’ve found that different Echinacea varieties have different booming periods. I remove the plants which bloom for a short time and keep the plants which bloom over an extended period of time. I’ve even found a variety which I call “Echinacea terrificalis” which blooms almost the entire summer season. I usually get an 80% success ratio over a two month period. One of the colorful new plants I saw this last summer was at the Meramec Community College gardens call Echinacea – Cheyenne Spirit. They are a AAS Winners and so should do well in most gardens. They come in numerous colors – I’d like to know how they do that. I bought some seeds this winter from Johnnyseeds.com. They are expensive – I received 28 seeds for $8. Compared to other sites, this was the cheapest source I found. The plants cost $15 each on ParkSeed.com, so I am theoretically saving over $400! The directions said both to plant the seeds on top of the soil and also that you could cover the seeds. I did both and will record my results below. With the not-covered seeds, I did make a slight depression to try and keep them moist, but did not cover them with potting soil. The AAS site says that you need to start these by Jan 25th to get blooming the first year. 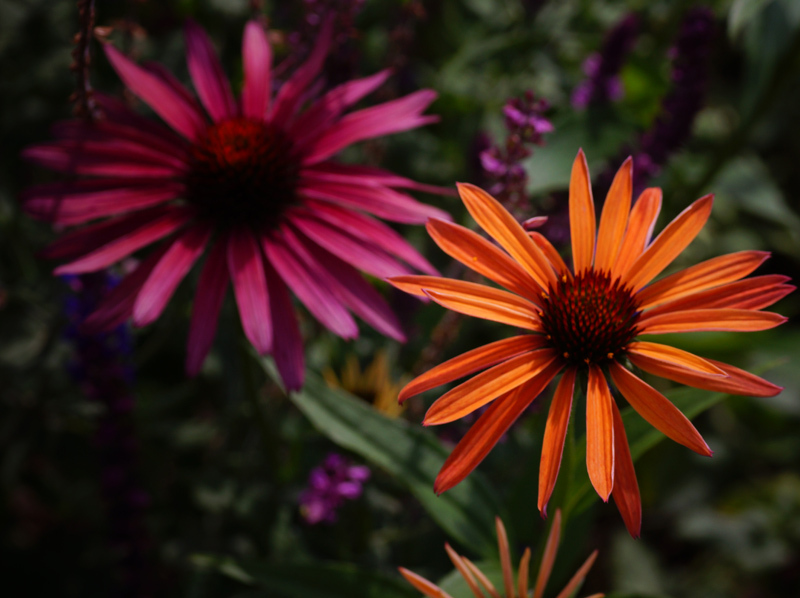 I normally think of Echinacea as needing cold-stratification, but the results below seem to indicate otherwise. The picture above is not Cheyenne Spirit, but is the closest I had from my garden. I’ll will post more notes as these plants grow and mature. Feb 11th – 24 of 28 seeds have germinated. Starting seeds on top of the soil, but in slight depressions, does give better results. Seeds that I covered initially, I uncovered and they have now germinated. Cold stratification seems unnecessary with these seeds. 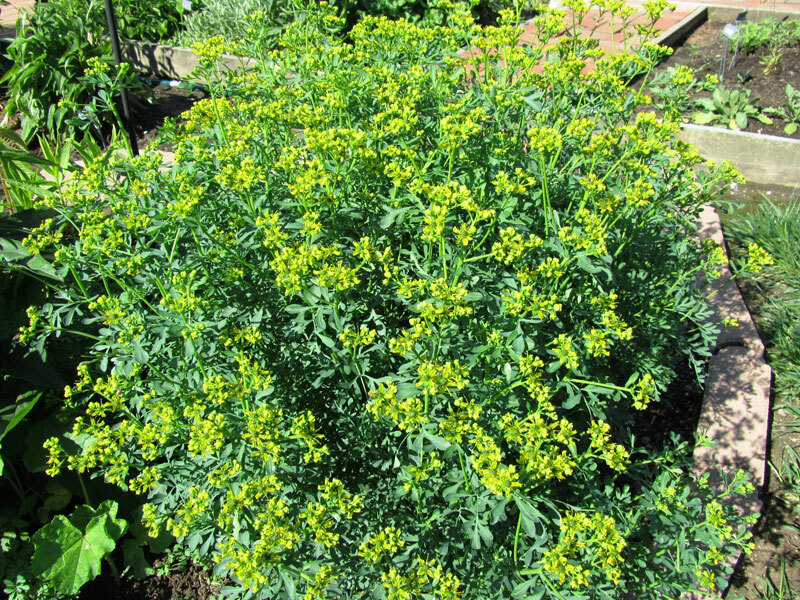 Rue, Ruta graveolens, is an almost perfect nectar and host plant for the butterfly garden. 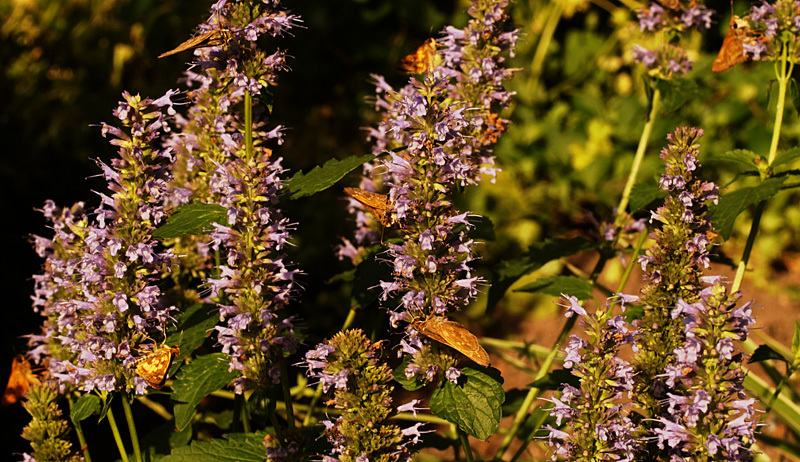 It’s pretty, attracts butterflies with its yellow flowers and is a host plant for black swallowtails and occasionally giant swallowtail butterflies. It also will usually come back every year and reseeds freely. It only has one flaw – it can cause a rash. I’ve never gotten the rash, but because of that potential problem I don’t recommend it for schools. I almost always wear gloves so that may have protected me somewhat. It even got a mention on an old Doc Martin episode, so the problem is real.